NASA has announced that the discovery of Kepler 452b, also known as Earth 2.0, is an earth-like planet in our galaxy. Over the years of data gathering from the Kepler space telescope and more analysis and work is there here on Earth; confirmed the scientists. As per them the existence of the distant exoplanet which is going to be the most Earth-like planet to be ever discovered. Though the planet is too far away to photograph, the advanced NASA technology helps to know more surprising information about this 'New Earth'. Beginning the conference, John Grunsfeld, who is the associate administrator in Nasa's Science Mission Directorate in Washington, says: Today we are announcing the discovery of an exoplanet which is pretty close cousin of our Earth. It's the closest so far. It's Earth 2.0. Before the conference, John Grunsfeld, who is the associate administrator of NASA’s Science Mission directorate from Washington said that today we are announcing the discovery of an exoplanet which was far as we can tell is a pretty close cousin of earth. It is very close so far, it’s Earth 2.0. A lot about Kepler 452b is very similar to Earth, like from its size, length of its years, and the estimated conditions on its surface. 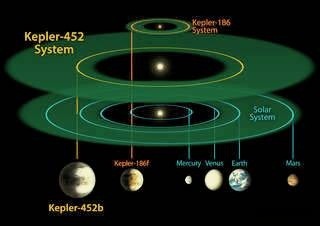 Years on Kepler 452b are about the same duration as they are on Earth. A year on the recently discovered planet, the time it takes to orbit its star, Kepler 452 lasts for 385 days, which means 20 more days longer than Earth. The above image helps you understand the different two years on other closer planets to Earth. A year on Venus, now and then the closest planet to the Earth, lasts only 88 Earth-days. A year on Neptune, which was further out in our solar system, is just equal of 185 Earth-years. Kepler spent billions of years within the best habitable distance of its star. Kepler 452 – is around 1.5 billion years older than our Sun. If a planet is to be very close to its star, then it will also be too hot to host life. But if it is too far away then it can be too cold also. Kepler has the perfect distance from its star for many billions of years. 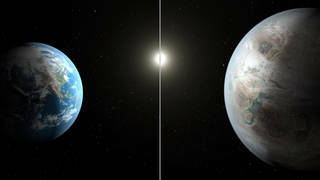 As per Jon Jenkins, the Kepler data analysis lead at NASA Ames Research Centre, it's possible that it hosts life on its surface, or may have some point in its history. It may also have active volcanoes and water on its surface. Kepler 452 may have the right temperature, which allows the liquid water to exist on the surface; as this is essential in supporting the lives. According to John Coughlin, a researcher from California at the SETI Institute says that Kepler team worked with geologists to find out the make-up of the planet. But, due to its size and age, be more likely to be a rocky planet, it could have a volcanic system under its surface. The researchers assume that humans could potentially stay alive in Kepler 452b's stronger gravity. The new planet is somewhat larger than Earth and is also predictable to have twice the gravitational pull of our own planet. Yet, as per the scientists of the Kepler’s team, this doesn't signify that it couldn't support life. Jon Jenkins says that humans could adapt to the gravity, probably becoming "stockier over many generations." We see today that people have already used to heavy weights; as we humans are built to do this kind of things. However, the human body has an astounding capability to repair itself. Plants could potentially flourish there. The Kepler 452 is to some extent larger than our own Sun. The additional light and heat energy that the planet receives from the star not only mean it is slightly heater than Earth, but also it could mean that plant life could thrive there. How plant photosynthesis produces the air we breathe, it is essential to building blocks of life to have a good chance of living on Kepler 452b. As per Jon Jenkins speech; the sunshine from Kepler's star is very alike to the sunshine from our own star, and the plants there could be able to produce photosynthesize just the same way we get. Let should we have a feel a lot like home soon.